Have you seen the hit flick Coco? If you haven’t you need to see it ASAP. If you have you probably know what an ofrenda is. An ofrenda is a collection of objects from a loved one that helps carry his or her spirit back to the ofrenda during Dia de Muertos. With the celebration of the Spanish holiday, all of our Spanish classes learned about the holiday and became pros in that retrospect. Some of kids in Spanish took part in that tradition and created some ofrendas to be seen at the Purdue Co Rec. The event took place on November 1st in the main gym at the recreation center on Purdue’s Campus. The ofrendas were very popular among the students at the high school, Suvi Taylor 11 said, “I thought the Marigold people brought in ones that looked nice and many of the people used color which made them pretty.” The event was crowded with people from Purdue and some kids from the high school. JT Downey 9 said, “They are cool because they are a big way in how day of the dead is celebrated. 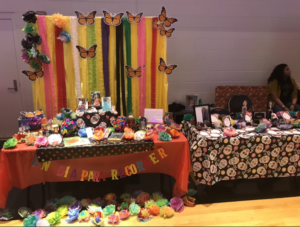 They are made to celebrate the deceased in your life.” The idea of the holiday was exciting to the kids, Corey Adams 9 said, “It’s a very special time when you get to make a scarifice to a loved one that you miss greatly.” The event had a wide variety of booths with different ofrendas. The booths had ofrendas made from our own students as well as students from Purdue University. All in all it was a gathering that brought many different cultures together and celebrated one holiday.